Now that you have decided on your concealed carry (CC) gun, you have to make an important decision about the holster you are going to carry it in. Like many CC folks, you have decided to carry your gun In-the-Waistband (IWB). But, you want to have the options of carrying it at the 4 o’clock position IWB and also with a small footprint in the Appendix Carry position with no cant and riding either high or low. You like both a leather and hybrid combination IWB holster that lets you tuck in your shirt and you want a quick clip-on IWB holster that is comfortable with a sweat shield, because you sweat often. You clip it on to ride high and sometimes to ride low on your belt when carrying at the appendix. You have decided that you want to pay much less than $100. for each holster. Well where do you start, since there are many types, quality levels, and prices of holsters? Is there such a thing as a “No Print” holster with almost all the many features desired for carry? 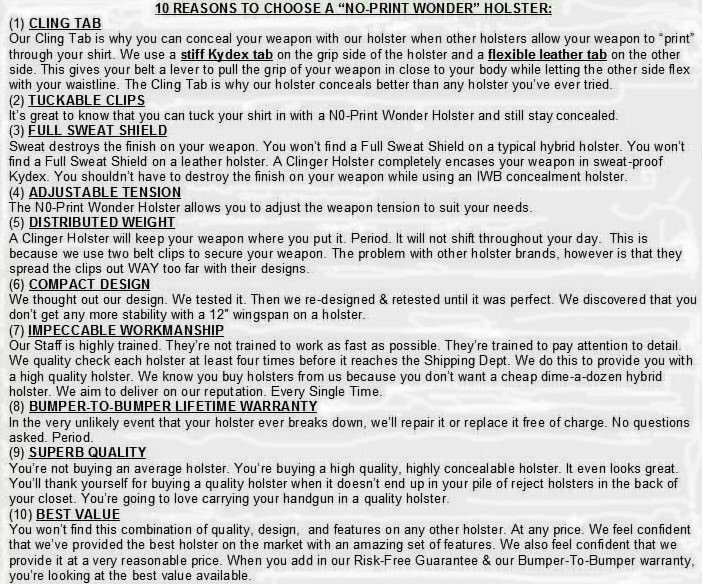 Well, one holster manufacturer offers a holster they call the “No-Print Wonder” holster. Really? What process will you use and how do you select your holsters? What are the criteria you should consider? What are your preferred features, factors, and your priorities and how do you rank them in importance? In this brief article, I want to share with you a summary of some of my holster criteria and factors I consider and present in my new Concealed Carry and Handgun Essentials book. Here I want to evaluate and Review the Clinger Holsters’ No-Print Wonder (NPW) IWB Hybrid with a 15 degree cant and the Stingray (SR) Clip-On holsters for both zero degree cant and a combat grip riding high, but also a flush fit SR with no cant that rides low with the grip above the belt. This flexibility with the Clinger Holsters is nice. Clinger Holsters is associated with American Concealment Solutions and was founded in 2013. The NPW happens to be a hybrid kydex-leather IWB that is tuckable. The SR is a clip-on the belt holster with a small footprint with a sweat shield. Will they meet your needs and criteria? Do they meet my criteria? I want to help you make an objective decision about selecting your IWB and clip-on carry holsters, applying the process I use. Keep in mind that what works for me may not work for you. So consider my criteria as a starting point, but have your own. You can add and subtract from the criteria I use. You probably have different criteria, preferences, desired features, and priorities. My 10 criteria and particular considerations for evaluating a holster are defined below. I will compare and evaluate the Clinger NPW and the SR holsters against each of my criteria using a 10-point scale. For each factor, a “10” rating is the best, a “0” the worst, and a “5” a mid-level rating. Here are my 10 Criteria for Evaluating a Holster. 1. QUALITY MADE: What is the material and is the holster constructed with quality workmanship? Is the leather of premium quality? Is the leather cowhide, horsehide, or other material? What weights are the leather and kydex? Will they stand up to your use, wear and tear, and is it appropriate for your use without impairing performance and mechanical function? What is its thickness and durability? Are the rivets, clips, grommets, snaps, buckles, rings, and metal parts strong, rustproof, steel, and quality made? Does it have a sweat shield or skin guard? Is it a reputable company? What type of warranty or guarantee does it have? Consider the holster’s weight and bulk. Is the holster designed to minimize the amount of leather and kydex needed to hold and protect the gun, to enhance draw, and reduce weight and bulk of the holster? 2. ALL DAY COMFORT: How comfortable is this holster during each of the different physical positions; walking, bending, sitting, standing, and twisting? Can you wear it while driving? Can you wear it for the entire day comfortably and not even know that you are wearing it? 3. 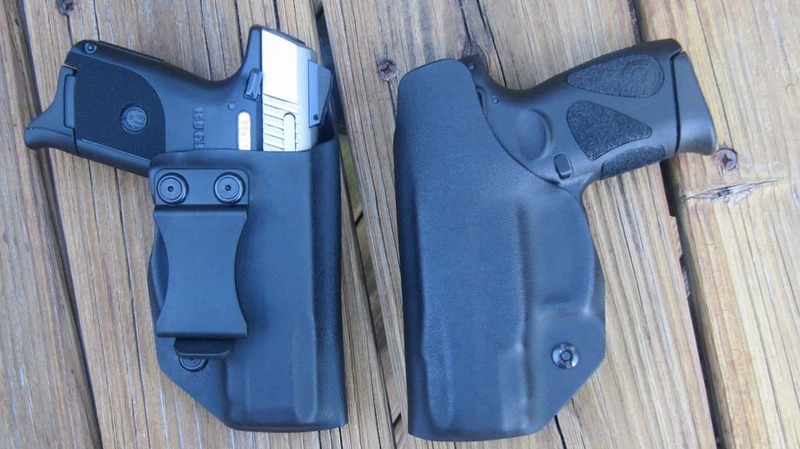 CONCEALMENT: Does the holster perform as required for the effective concealed carry purpose? How well does the holster hide the handgun during every-day body motions, like walking, bending, sitting, standing, twisting, reaching, etc.? Imagine wearing the holster during these different movements. Is there a cant and angle adjustment for the holster, to provide better concealment and comfort? 4. 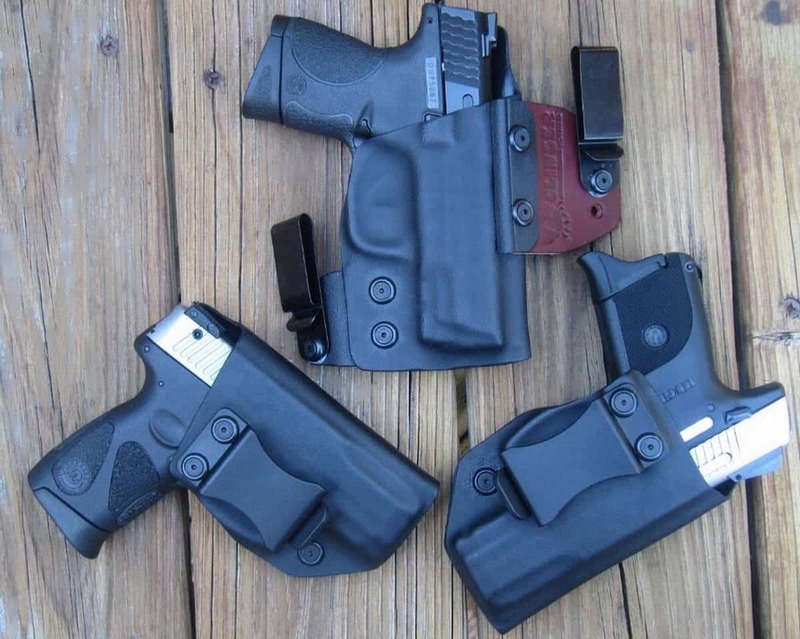 ADAPTABILITY & FIT: Does the holster custom-fit your specific gun? Can this holster be used for different handguns… or with a Laser sight or light, if desired? How versatile is it? The safety features of a holster very much require that the holster be engineered and designed to FIT each specific manufacture and model of handgun. Are there modifications available or additions that adapt to other handguns? Is the holster cant adjustable? Are various cant degrees offered as options? What are the approximate costs of these adaptations or options, if any? Is the shooter’s gun properly fitted for this holster. Does the handgun insert so deep in the holster that the gun grips cannot be properly accessed? Does the gun jam so tight into the holster that it takes two hands to draw it or can you draw the gun easily with one hand? Can you grip the handgun securely without parts of the holster interferring, when accessing it from deep concealment? Is the holster weight well distributed, so it does not shift throughout the day? 5. PRICE: What is its total price relative to other options available now in the market? Do you get any special features, options, warranties, guarantees, repair service, or additions that are worth something? Can you return it without any questions and within what time period? Will they repair or replace it for free? Do you get what you pay for? 7. EASE OF REHOLSTERING & ACCESS: Can you reach your handgun quickly in an emergency or while sitting in your vehicle? A rigid holster will allow a handgun to be returned to it using only one hand, while a flexible one may collapse after the gun is drawn, requiring the use of both hands to reholster. How easy is it to access your weapon and use the holster while walking, bending, sitting, standing, twisting, etc.? 8. EASE OF PUTTING ON & TAKING OFF: Can you simply and easily put the holster on and take it off? Consider if you will be putting this holster on and taking it off throughout the day and under what conditions. Must it be removed for taking care of personal needs in public restrooms? If so, can you do it safely and easily? 9. ACCOMMODATIONS: Can you wear both open or closed cover garments with the holster? Do you have to wear special clothing or make accommodations in dress or draw when wearing and using this holster? Is a cover vest or larger trousers required to hide the holster and handgun? 10. RETENTION: Does the holster retain and secure the handgun adequately? Is the holster snug when fitted on a gun belt for a consistent and fast draw and to reduce draw resistance. Is the gun tight & secure in the holster? A holster designed with solid retention will help prevent a gun from being removed from the holster by another. Is the retention level adjustable? After each of my criteria listed below, I give a brief comment about each and then give my rating for each criteria for both the NPW and the SR holsters. Each holster is given an independent rating for each criteria immediately after the holster’s abbreviation. For example, after criteria number 1 (Quality Made), I give this evaluation: 10 (NPW); 9 (SR). My final buy or not buy Recommendation for each holster separately is given after all 10 criteria are evaluated for each holster, at the end of the review. Keep in mind that these are just my opinions. 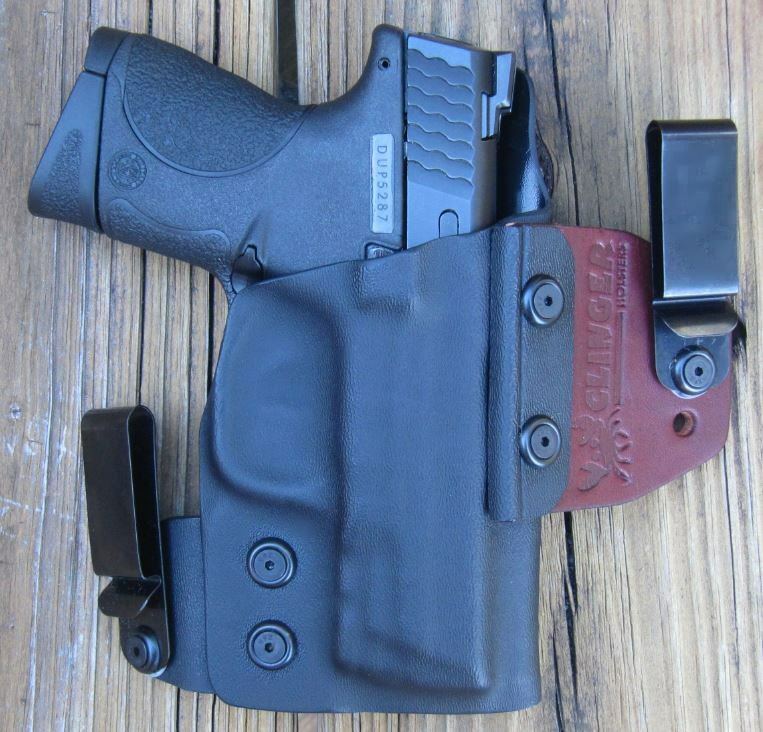 The Clinger IWB Hybrid tuckable NPW holster is well designed, nicely made in America, and is a very good combination of leather and durable kydex. I love the natural look of the leather tab and it works to adapt to your body. The leather is very supple and really helps the comfort of the holster when it conforms to your body. Its thickness is ideal for strength and flexibility. The hardware and clips are made well with steel and are corrosion resistant. The belt clips are 1.5″ and come in steel (my preference) or nylon. I could easily tuck my shirt behind the clips and it is easy to draw the gun after lifting the tuckable shirt. The .080 kydex portion was light, but rigid and durable enough. It helped me have a smooth, fast draw. Really like the “Two Weeks, Try-It-For-Free” Guarantee. Also, like the 2-3 weeks lead-time for shipping. There is a Lifetime Warranty on all holsters. After wearing the IWB NPW for about a week, I became use to it and really did not notice it much. It was comfortable for me, although I prefer leather touching my side rather than the kydex skin contact. The small leather tab did absorb a small amount of my perspiration, but no problem at all. The small 4.75 mm thick leather Flex Tab did help its comfort because the holster molded to my waist. The 4.15 mm thick Kydex Tab helped hold it close to my body and I could quickly grip and smoothly draw the gun. My gun did not fall out and I found the holster to be very satisfactory when bending over, walking, sitting, crawling under things, lifting, and exercising. The kydex sweat shield on both holsters was very nice, but I prefer a cowhide leather backing next to my skin for my IWB holsters. The Cling Tab of the NPW holster really did help conceal my gun very well. It had a snug but accessible fit for my gun, covered the trigger well, and concealed it great. Others did not even notice I was carrying and did not mention anything.The steel tuckable clips were easy to use, worked just fine and helped with concealability. You have to practice grabbing your shirt & pulling it up enough to untuck it from around the gun (like with all tuckables.) Clinger Holsters states “Your gun will NOT print” in its advertisements. It did conceal very well, helped by the leather and kydex tabs. Its quality design for concealment was similar to Comp-Tac’s fine MTAC holster. 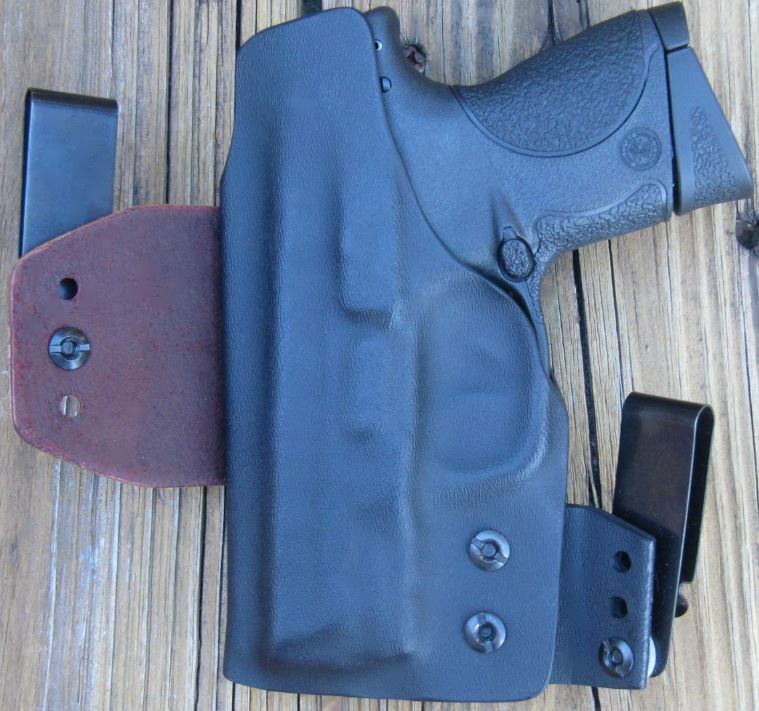 The NPW’s combination of leather and kydex was a great mix for a hybrid holster. Its’ small footprint was very adaptable to my body and the leather flex tab helped it mold to my body and it fit very well. The NPW and Stingray holsters do not have large footprints (have smaller widths) and both have adjustable cants. There were only 3 levels of cant adjustment for the NPW, while some competitors have 5 levels. The stiff kydex tab and flexible leather tab combined to help hold and conform the NPW holster in close to my body for a nice fit. Both were adjustable for retention and the NPW was adjustable for ride height up and down and was tuckable. The edges of both holsters were smoothed for a nice fit. Interestingly, my S&W M&P 9C and Ruger SR9C pistols both fit in the NPW holster, which was custom for my M&P 9C. My Taurus PT111 G2 fit in both the high ride and low ride SR holsters. The SR9C fit in the high rise SR, but not in the low ride SR holster. Recognize that usually you do get what you pay for. Although price is not a major variable for a critical tool like a holster, it is a criterion. The NPW’s price of $69.99 was higher than I usually would want to spend for an IWB holster, but it has obvious quality advantages and other nice features to help justify the higher price. The price of the SR was $39.99 for a clip-on holster. There are some less expensive IWB options and clip-on options available, but it depends on your requirements, priorities, dedicated funds, etc. Other similar hybrid rigs (each with pros and cons) I found ranged from $44. to near $100. Some had premium leathers and thicknesses, plastic v. steel clips, with & without a combat cut, with & without a sweat shield, more adjustment options, high-quality leather backing, available videos for adjustments, etc. Some examples: Comp-Tac MTAC for $65; Galco King Tuk for $60; Alien Gear Cloak Tuck 3 for $44. A third available model is the Atom holster which is less expensive at $29.99 and without a sweat shield. I do not have any reservations whatsoever about the safety features of this holster. It covered the gun’s trigger well and the gun fit snuggly in the holster, like it was suppose to for a custom holster. I did not have any problems when presenting/drawing and removing the gun in and out of the holster. It is a well-designed holster that exceeds the requirements for an IWB tuckable hybrid holster. I was able to keep my trigger finger straight along the outside of the holsters easily and to grip the gun quickly and correctly to prevent negligent discharges and without accidental disengagement of the safety. I did not have to use two hands when reholstering or drawing the gun from the holster. The SR rode very low when clipped on my belt; too low for me, but not a major problem, since a higher riding clip-on model was available. Just wish the ride height was adjustable in 1 holster. I could reholster both with only one hand. It was easy to reach and draw my handgun quickly and to re-holster it without looking or using two-hands. I do not anticipate any reholstering problems even in an emergency or when sitting in an automobile. I liked that the holsters were adjustable for retention, cant, and ride depth (only NPW.) It would be nice to have “how to” videos for adjustment tips and wearing, etc. on their website. It was very easy to put on and take off the SR holster, once I decided on the best location for it inside my pants and practiced. Being a little “chunkier,” I like wearing at the point of my hip bone at about the 3:30 o’clock position. The NPW required a lot more time to put on and take off, mainly due to the clips. It would be nice to have low profile C and J clips options and leather loops for quicker and easier placement. After some practice, I am able to put it on better. You have to learn and practice how to blouse or fluff your shirt in the tuckable area. Both holsters fit inside my pants very well and I did not have to buy a larger size pants to use them. I could easily wear both open and closed cover garments without any concealment or operational problems. I did not need any special clothing or extra accommodations in dress or draw when using the holster. The NPW and SR holsters did retain my 2 different guns just fine. The NPW and its flex wing and kydex wing helped the holster fit my body style good and even helped to tighten the retention and made my gun more secure. The NPW may be a little too close in for my particular chunky body. When I held both holsters upside down with my guns inside, they did not fall out. Also, when moving quickly and running, I did not lose my gun and it stayed put well in both holsters. My high-quality belt helped this and you can reference my book’s gun belt selection chapter which has criteria to help you in selecting the proper gun belt for carry. Total Points: 93 points out of 100 possible = 93% = Recommended. Total Points: 92 points out of 100 possible = 92 % = Recommended. I hope my process and this review has saved you some time to help identify your own criteria and to evaluate your individual preferred factors for selecting the best holster for your purpose, needs and priorities.